Build online directory websites with ease using GoClixy - PHP Website Directory Software. Upload your logo and you are ready to go! 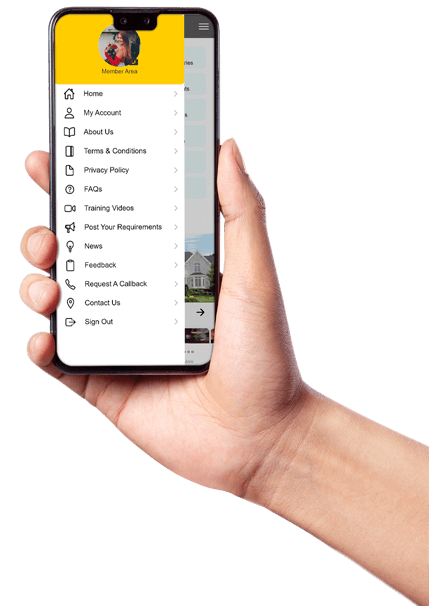 Fully customizable, Free Mobile App, Featured Listings, Banner and Adsense Advertisements, Membership Plans and much more. Start your online business directory website today. It’s easy. We provide a Free Installation for our Business Directory Software, you will get your site up and running in about ten minutes. Text Messaging is an instant marketing tool, provide the key and allow your visitors to send messages to businesses and friends. Easy to import data using CSV/XLS/XLSX file. 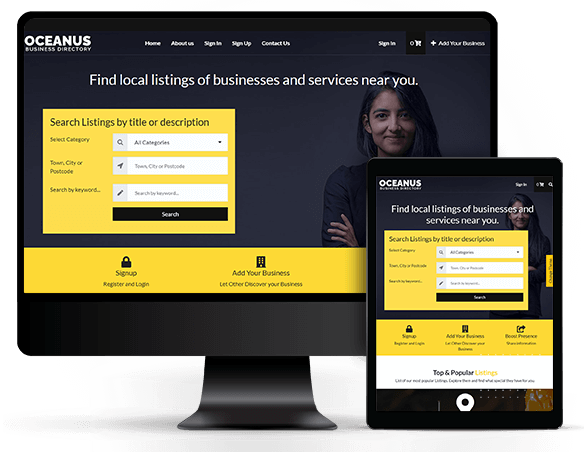 Populate your yellow pages website with a lot of listings in a short amount of time. ready to generate recurring income stream to any business. Easily customize your directory with just a few clicks. Even the Form fields can be changed without any coding knowledge. GoClixy provides an optimal viewing experience for the user. The script is fully adaptable to different mobile devices. GoClixy supports multiple languages. You will be able to translate each and every part of your bsiness directory with ease. Different themes are available with GoClixy. Choose your design with a wide variety of blocks and customization options. Set up multiple payment gateways and handle transactions gracefully. You can also have your own Payment Gateway. GoClixy directory script is completely secure and reliable. During development, we focused on each and every aspect of security. Features that help you generate recurring revenue from your online business directory portal. Create unlimited free and paid membership subscription plans. Give different privileges to different users and restrict the benefits of each subscription plan. Restriction can also be imposed to form fields. Let business owners easily add a form to their listing so that their customers can book them online. Earn a commission on each of their customer's booking. Can be used by Hotels, Hospitals, Lawyers, Cleaning Services etc. Allow business owners to sell goods and services with no barriers of time or distance. You can set a commission on sale of each product, Commission can be package or product specific. Let your users pay only for those services they are willing to add on your website. They have to pay the amount before they can add a listing, product, blog, event, job, property etc. Increase your future sales with our Lead Generation module. Collect information from your visitors and deliver them to the appropriate business owners on paid basis. Let Business Owners advertise on your online directory website, since they have to pay an amount on ad click, this is how you can make money through our advertising module. Increase the amount of visitors to your online directory software as GoClixy is optimized for higher ranking placements. Promote your yellow pages portal by assigning points to your users on performing different activities. A digital payments platform that allows your users to transfer cash into the their wallet via different payment gateways. Rewards your users for their referrals. They will earn commission in form of points or cash in their wallet. Increase sales by offering your users a financial discount on buying of a membership. Give commission on each purchase made by others using a specific invitation code. What types of directories can be built with GoClixy? Possibilities are endless with GoClixy, you can build online directories for any industry and location. Why choose GoClixy - Business Directory Script? Get unique appearance on Internet with different layouts. Our directory software is packed with a lot of features from top to bottom. Launch your idea with ease and let commuters find local businesses in a locality. Why should I select GoClixy over other available solutions? GoClixy modules worth more than $1000.00, so be ready to get more than your expectations. You will not find most of them in other available directory solutions, but in GoClixy, everything costs only $ 149.00. "We really enjoyed our interaction with GoClixy. Everything was handled with the highest level of professionalism. GoClixy has an amazing support and an after sales service. We are quite pleased with the outcome of our collaboration and look forward to working with GoClixy again." "I have been looking for directory script for years, I even bought 2 directory script for 200$ each other and they all turned out to be bad, I met Goclixy a few months ago and they really showed me what directory script really is. BEST SUPPORT EVER, Goclixy support is unbelievable, very every good. If you really want to be one of the best directories around the world, START WITH GOCLIXY." "I'm up to 4.5 million listings and your software is running great. Your software "rocks"!. " "You without any doubt have the best directory software and I am proud to be a member, the time and effort you have taken to do this application including the manual worth every second. I thank you again and again. I have being pursuing my dream with directories scripts or software and finally I found your company. I am very happy to be in good hands. " "A lot of companies offer business directory script, but most do not offer a great price and a good team to help newcomers to their questions and problems as GoClixy does..."
"I want to thank you for your support, dedication and passion to ensure that my problems were solved! I must be honest, I was skeptical at first, but you worked on every small detail that I asked of you." "I am very happy to be with you. GoClixy is one of the best business directory software. I'm so happy with different themes and easy to use interface. I do make my first experience with business directory website setup and with your service and support it is really easy..."
Get GoClixy Directory Script for a great price.